Dusky titi monkey are found in heights up to 1000m in the humid forests or rainforests. 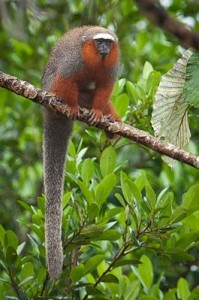 Dusky titi monkeys have a beard, that is surrounding their face and covering their throat. They have long soft grey up to brown fur and are 25-40cm tall (without tail). Dusky titi monkeys are living in pairs or families. They feed on fruit, insects, spiders, small birds and birds eggs.